As a director of my district’s digital citizenship program, I’ve been concerned about our seniors graduating and heading on to career or college pursuits without a digital portfolio. For the past 10 years, Kathleen Watt, my #digcit program co-director, and I have been offering workshops to help teachers support their students in creating and curating K-12 digital portfolios. 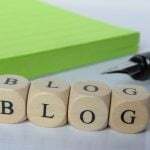 We recommend blogs as the best venue for students to begin an ongoing process of documenting their learning journeys. So it felt like a pat on the back to hear George make the same recommendation. 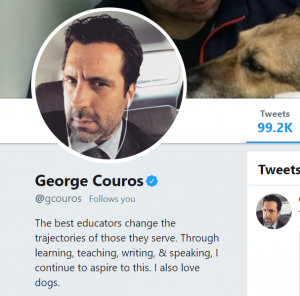 There’s a reason @GCouros has 212K followers! George also pointed out that not only do students need to have portfolios – so do teachers. He then reiterated that the best ePortfolio students and teachers can have is a blog … Oh, wow, why had I never made this personal connection before?!? This quote was my biggest takeaway from the lunch session and conference. George’s stance that “teachers need to create portfolios using the same platform they are pushing” was also validating. 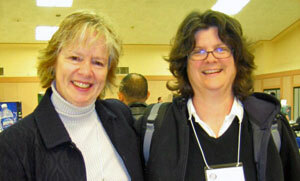 Years ago, we purchased Edublogs Campus Press for district-wide access. Outside of my district job, Blogwalker has been my personal space for reflecting on new ideas and resources, documenting conferences and workshops attended, and showcasing the work of colleagues and leaders who inspire and add to my teaching toolkit. But until this session with George, I had not thought of this blog as a portfolio. I left the conference re-energized and committed to adding another round of blogs and blogging back into my workshop offerings, using Google apps (and VoiceThreads, podcasts, video creation, etc.) to create, collaborate on, and curate content that will ultimately be housed on a blog. Over the years, I have cut back on my blogging workshops because, too often, I see teacher-created blogs used simply as a venue for posting homework. I suggest, instead, using a Google Site rather than underutilizing a blog. So, yes, I will continue to recommend that teachers post homework on a G Site – but with the strong recommendation that they to tap into all that a blog offers for maintaining a personal ePortfolio! 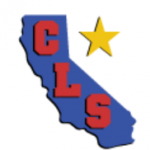 Since 2008, I’ve had the pleasure of participating in, learning from, and contributing to a number of amazing communities (Google Teacher Academy, Microsoft Innovative Educators, Rushton Hurley’s MERIT program, CSU Sacramento’s iMET program, UC Santa Barbara’s Center for Teaching for Social Justice, and more). I think I’ve always attributed acceptance into these programs to luck and maybe a good recommendation or two. I realize now that everytime I apply for a local or national program, I’m asked to include my Twitter handle (@GailDesler) and social media links, such as a blog. I’m wondering how many review committees have visited Blogwalker before sending their “Congratulations! You’ve been accepted” letter. When those committees have to make cuts to their lists of applicants, are educators with personal blogs/ePorfolios given priority over those without? I would love to hear from fellow bloggers why you blog and what benefits you have experienced. I warmly invite you to leave a comment. And if you need a little inspiration and motivation to start blogging, subscribe to George’s The Principal of Change blog! I work in the Technology Services Department for a large public school district. I love my job (technology integration specialist) and truly appreciate my department’s support of programs that promote digital literacy and the potential for students – and teachers – to advance from digital citizens to global citizens. As a former classroom teacher, I witnessed many times the bump in literacy skills that happens when students know their work really matters, a change that generally requires an authentic audience. Blogging can provide a 24/7 microphone for students to join in virtual conversations with students and classrooms across the nation and world – and, in the process, cross the line from consumer of information to creator of information – and from digital citizen to global citizen. I’m ending this post with two things: a blogger’s poem and an invitation. If you give a student a website, at first, he isn’t going to be sure what to do. He will start by wanting to decorate it and personalize it too. He’ll no doubt choose some interesting colors and flashing widgets – making sure he has the most. Once you go over expectations, you will assign the student to write his first post. The student will ask, ‘is this for a grade?’, and he will probably groan. But once he publishes to his new website, he’ll immediately want to pull out his phone. He’ll post a link to twitter and facebook, out across the interwebs his post will be sent. He’ll hit refresh in his browser, over and over, just hoping that a visitor has left a comment. Before long he’ll see the comment notifications show up in his queue. And an ongoing dialogue between his family, friends, and classmates will certainly continue. So the next time he learns something new in your class, there won’t be much of a fight. Before you even get the chance to finish, the student will ask if he can write another post on his website. #2 ) An invitation to share classroom and student blogs I could showcase in my next post on blogging best practices. Please leave a comment with links! Best wishes to everyone for the 2017-2018 school year. PS Thank you Pixabay for cc licensed blogging image! *Providing email notification is as easy as dragging and dropping a widget/gadget into your sidebar. The $2 Interactive Whiteboard – I’ve seen it in action! One of my favorite things about the Edublogs Awards is the end product: an amazing compilation of links to innovative, super smart educators, many who are new to me, annually assembled in one convenient location. Given the current economic crisis in California public schools, I was drawn by its title into the winner of The Most Influential Blog Post – The $2 Interactive Whiteboard. High school physics teacher Frank Noschese’s case for the $2 IWB over the $4,000 front-of-the-room IWB will either confirm or make you rethink how to maximize dwindling technology budgets for the sake of student learning. In my case, I already had a window into the benefits of the $2 IWB while visiting middle school science teacher Kelli Quan’s classroom. From the video below, I think you’ll understand my excitement in watching Kelli’s students – on the first day of the new term – already collaborating, questioning, and learning from each other. Due to some time constraints, I interviewed Kelli prior to her teaching the lesson – and prior to reading Frank Noschese’s post; therefore, I did not ask about the use of IWBs, mainly because her site lacks funding to jump on the IWB bandwagon. Thanks to the Edublogs Awards, I am now watching the video with new eyes, struck by the fact that 100% of her students had access to a powerful, affordable technology throughout the lesson as an integral part of their introduction to scientific thinking. Think I’ll head back to the Awards in search of more low cost/no cost gems to share with teachers. Best Individual Blog – Educating Alice – Monica Edinger’s posts will keep you on top of the latest in children’s literature – along with insights on how to team literature and technology. Best Individual Tweeter – Larry Ferlazzo – I don’t always have time to read through the sheer volume of great resources Larry shares on his Websites of the Day site, but every time he posts a resource to Twitter, I know it will be well worth my time to open the link. Best Group Blog – Voices on the Gulf – Once again, my friend, mentor, and NWP colleague Paul Allison makes “keeping it real” part of this timely online community of teachers, students, and community leaders who have joined Paul on a year-long investigation into the impact of our nation’s worst oil spill. Best Class Blog – Ms. Cheung’s Connection – A 4th grade teacher in my district who always teaches from the heart (despite the pressures of a Title 1 site in its second year of Program Improvement), Teresa Cheung’s projects are always a source of inspiration. Best Resource Sharing Blog – The Edublogger – You don’t even have to be a blogger to benefit from Sue Water’s shared conversations, great resources, and wonderful humor. Most Influential Blog Post – Miguel Guhlin’s recent post Nurture Human Talents. If you are looking for the research and the argument for all students’ right to become producers of information (not just drill ‘n kill consumers), you definitely need to read this piece. Best Educational Wiki – Resources for Digital Writing and Digital Teaching – Considering Troy Hicks’ volume of outstanding publications and presentations, his wiki is the next-best-thing to traveling to a conference to attend one of his sessions or heading to Amazon to order one of his books. Best Use of Audio – YA! Cast – Looking for a site to amaze teachers about the possibilities of Audacity and podcasting? Robert Rozema’s pre-service teachers can show you! Best Use of Video – The Power of One – (NWP colleague) Lesley McKillop’s 4th graders take their voices beyond the classroom via video to change their community and to connect with online communities across the nation in creating and sharing information. Best Use of a Social Network – Know ELLs – Feeling a little overwhelmed about how to best meet the needs of your English Language Learners? From the National Writing Project, such a brilliant group of teachers sharing their expertise and resources! Best Use of a PLN – Edutopia: What Works in Education – With project-based learning experts such as Suzie Boss leading discussions and amazing workshops (including last summer’s session on studying and teaching the PB oil spill), I think there is something for everyone at this site! Lifetime Achievement Award – George Lucas – In a year when teacher-bashing seems at an all-time high, I really appreciate all George Lucas has done to support teachers and celebrate public education. Hey, what’s with the pop-up ads on EB blogs? Last week a colleague asked me about the links to “Content Ads” that popped up when she accessed – for the first time – the Kids Book Blog (an EB site run by 5th and 6th graders at Joseph Sims Elementary School). Since I had never seen ads on any of my EB blogs or in any of my teacher trainings, I contacted Sue Waters, The Edublogger, for an explanation. Thanks to Sue and after doing a little reading in the EB Forum, I now understand that there is a very good reason for the Content Ads, and that, most likely, few of our blog readers will ever see them. •	Remember back in October when James Farmer was upgrading EB servers? As always, the brief disruption in access to our blogs resulted in more “goodies” being added to our EB toolkit. This last upgrade, however, has exceeded James’ budget. And that’s not a good thing. But being able to count on continued membership in the EB community of educators is a very good thing – far outweighing the occasional appearance of Content Ads on our blogs. •	Only first-time visitors to your blog(s), who are not logged into Edublogs, would see the ads. On their second and subsequent visits, no ads would appear. In fact, very few people would see ads at all, but enough search engine visitors might in order to help Edublogs cover the bills and continue to grow and develop. •	For the last year, I’ve been an EB Supporter, which means that for a mere $25 per year (less than the cost of one Starbucks latte per month), I not only have extra space, a few more widgets, etc., but I also never have ads appearing on my blog. •	You will not see ads on any blog you are logged in to or have visited more than once. •	No one who has bookmarked your blog(s) or types in your URL will see any ads. It’s been a rough couple of weeks for the Edublogger community. As as veteran Edublogger (my first EB post was in March 2006), I’ve have been through a few upgrades and therefore know that when EB returns, it’s even better than before. I’m thinking back to June of 2007, when there was a two-weekwindow of down time during upgrades. I was attending a NECC Conference in Atlanta where a number of “big names,” such as Will Richardson, were attempting to introduce EB as part of the their blogging workshops. Because they’re used to working through technology issues, not having access to EB was not that big a deal. But here’s what’s changed for me … Over the past two weeks, I’ve received many emails from teachers who’ve been in my EB workshops wondering what was going on. OK, this is a huge shift. Since most of my district, county, and A3WP workshops are free, I’m never really sure if my attendees truly want to learn about blogging, or if they are just looking for free units to apply to their salary schedule. So about those emails….bring ‘um on !What the flood of questions means to me is that I now have a growing bank of teachers who are incorporating Web 2.0 technologies into their teachers’ toolkit. What felt like just a ripple a year ago is starting for feel a tsunami. Welcome back EB! I’ve been working fast and furiously to keep up with all the changes happening at Edublogs.org. I’m pretty sure James Farmer never sleeps in order to keep up with the updates, enhancements, fixes, and forum discussions. So here’s a link to my latest Intro to Edublogs Manual. It’s pretty complete, but I plan to keep making updates as needed and posting the links here as well as in the sidebar (under Resources). A huge virtual hug to James for all his efforts – and Sue Waters too! Check out Sue’s video tour. Amazing what can change with Edublogs in the course of a week! I considered deleting my previous post with its link to my “updated” EB Manual, which as of today is is already very much outdated, but decided to leave it just as proof of what a dynamic application and community the Edublogs.org is. Hope to have to have a revised manual available by the end of the week. For an update at a glance, check out The Edublogger’s Quick Tour, created by and updated regularly by Sue Waters. 3. Meeting and co-presenting with Alice Mercer – I met Alice about a year ago in the chat room of a Teachers Teaching Teachers Skypecast. From there I started connecting with her in the blogosphere, first through her classroom blog, which was often the model that made visible to teachers in my Web 2.0 workshops the power and possibilities of blogging with students. As a regular reader of the Blog of Mz. Mercer, I feel that I know Alice pretty well…yet…(and here comes the blogosphere connection)…Alice I had had never met face-to-face until walking into the auditorium at Granite Bay High School yesterday morning. Thanks to Skype, Edublogs, and Wikispaces, we did our pre-planning online and were ready to jump in and – together – lead two workshops: Blogging for Absolute Beginners and Going Live with Edublogs. If I do say so myself, I think we did a great job:-) . From your Dashboard, click on the Comment tab, locate the comment you want to respond to and click on the Edit link. When your code view opens, select italic and/or bold so that your comment will be noticeably different from your student’s comment, and add your comment. When you’ve finished, select italic and/or bold to close your comment, and click on the Edit Comment button. I’m already looking forward to next year’s CTAP3 conference – but immediately to next week’s Web 2.0 Conference in San Francisco!